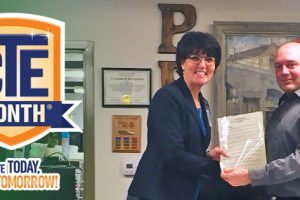 Last year at this time we approached the Clinton County Legislature, the City of Plattsburgh, and the Town of Plattsburgh. 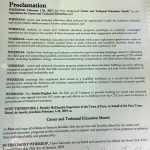 Each, in turn, passed a proclamation/declaration, recognizing CV-TEC and our celebrated CTE Month. This year, we have approached the Town of Beekmantown, the Town of Champlain, the Town of Peru, and the Town of Saranac. 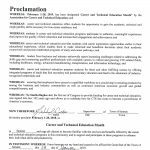 Last night, Michele attended the Town of Peru monthly meeting, during which time, the Town Council passed its declaration on behalf of CV-TEC, and in recognition of CTE Month. 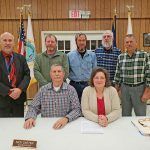 I concurrently attended the Town of Saranac meeting, during which time, 4 of the 5 Council members proudly stated that they had attended CV-TEC earlier in their lives and were proud to pass a declaration on our behalf. One of the Council members has had a number of pieces of Heavy Equipment refurbished by Mr. Lacroix’ students (they are currently working on his excavator). 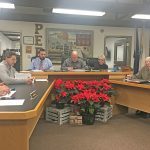 Attached, please find a photo of the Town of Saranac meeting and a copy of the declaration. As mentioned, we still have two more Town meetings (in February) to go! 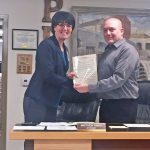 The Town of Champlain meeting will be presided over by our own School Board President, Mr. Larry Barcomb. Arthur, Jim McCartney, Principal of the CV-TEC Plattsburgh Satellite Campus.